Let's talk about the various types of end mills. There are up-cut, down-cut, compression cut end mills with varying numbers of flutes. End mills and bits have shanks with varying diameters and cutters of varying diameters also. 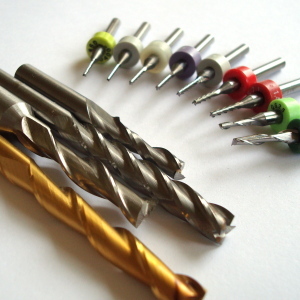 Materials also vary with end mills and for appropriate applications. Finally, the shape of end mills vary depending on the application. What can you do with an end mill? Well, primarily, end mills are intended to cut horizontally. That's the beauty of end mills. They can also plunge (drill) into the material, but this is actually hard on end mills, unless the end mill has this feature. You will probably see many CNC machines ramping down as it cuts a horizontal edge to prevent excessive wear on the end mill. Up-cut, down-cut and compression cut determine the way the chips (cut material) are ejected and the smoothness of the surface. With an up-cut end mill, the chips will be ejected upward and the bottom of the material will be smooth. The down-cut end mill is the reverse by pushing the chips downward and the top of the material is smooth. You can guess what the compression end mill does... It creates a smooth surface on top and bottom, which is perfect for pre-laminated woods. You will typically find that the end mills vary in size ranging from micro diameters to upwards of one inch or more. The end mill pictured on the left has a 1/8" shank (the shaft that is inserted into the spindle collet). The selection of size will depend on your application. Of course, large diameter end mills will not create perfect inside corners... actually none will since all end mills have some diameter. There is one exception. however. There are end mills with points that can create great bottom corners, but I will discuss that below. You will find that, depending on your application, a single general purpose end mill will suffice. The size of the end mill will also determine how fast you can cut the material (feedrates). Larger end mills can remove more material per revolution than a small end mill. Respectively, if you push a tiny end mill too fast, you will break it. Flutes are the cutting edges that are wrapped around the end mill, like a spiral. 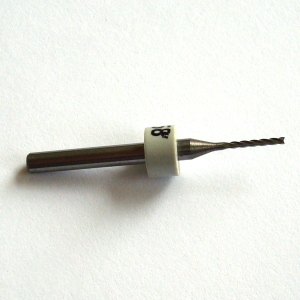 The image below shows a two flute end mill which can be identified by the very end of the end mill. The more flutes on the end mill, the smoother the edge finish will be. One important aspect of a great number of flutes is the capacity of chips it is able to eject, so the more flutes on an end mill, the slower a feetrate must be. The end result is finer chips. You will also find that there is a helix angle to these flutes. They can be as straight as vertical, or angled. The angle to select will depend on the material being cut. End mills come in a variety of materials. The hardness of end mills determine the material to be cut and the cost of the end mill. Solid materials for end mills are HSS (High Speed Steel) and Carbide. Carbide is the harder of the two, will last longer and can handle faster feedrates. To make carbide even better, there are various coating material applied. The gold coating on the left is TiN. No, not the material of cola cans, but a very resilient material (Titanium Nitride) that can withstand higher heat and provides a bit more hardness. Other coatings include: TiCN (Titanium Carconitride) which is great for various metals, TiAIN (Titanium Aluminum Nitride) which is even better for metals (not aluminum which is in the coating itself), AITiN (Aluminum Titanium Nitride) with similar characteristics as TiAIN, and finally Diamond, but don't get this for your loved one, unless they need a tool. Don't use diamond on metals either, but this material coating is superior on other materials especially composites and graphite. I'm currently testing this on cutting my MDF (so far so good). I actually got this recommendation from a user on the site. The shapes of end mills vary extremely widely and is the most important aspect for your application. The shape of the end mill will determine the shape of the final cut and even on the material being cut. 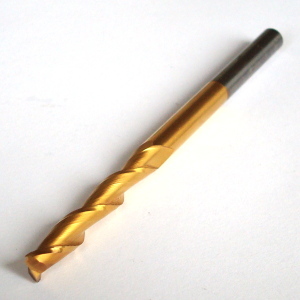 There are round nose end mills that look similar to drill bits and are great for plunging. V-shaped end mills have a great variety of their own shapes. A long bv-shaped end is great for wood carving and a shallow v-shaped end mill is great for lettering. There is also the square end end mills that create a nice flush bottom of a center cut. The applications are endless. One final type of end mill that is worth mentioning is the roughing mill also called the hog mill. The end mill is great for steels and can handle fast feedrates.